Smack dab in the middle of a Midwestern winter is the perfect time to indulge in one of my favorite sections of the bookstore, Armchair Travel. This section doesn't need any explanation, but it does need steerage occasionally. Many hit movies come from this genre. Eat, Pray, Love and A Walk in the Woods, A Year in Provence and Under the Tuscan Sun all originated with a book of travel adventure. Extra Virgin is the tale of two British sisters who leave the London winter and travel to a small Italian village to work the season grafting roses. 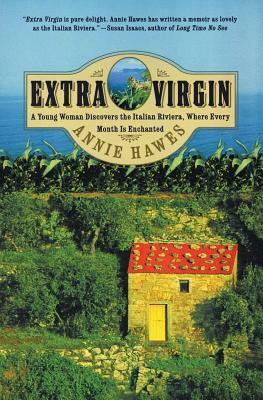 In 1983, a pale Annie Hawes and her equally pale sister leave England for the sun-drenched olive groves of a small Italian town in Liguria. With fantasies of handsome tanned men and swimming in the sea urging them on, they are hired to work for ten weeks to graft roses -- of which they have little knowledge -- along the Italian Riviera, board and lodging included. But none of the men seem to be under forty, and Ligurians have particular ideas about life, including swimming ("To go swimming in seawater outside the month of July or August is even worse for your health than drinking cappuccino after twelve noon!"). But Annie and her sister are captivated by San Pietro's quirkiness and beauty, and suddenly their brief stay stretches into years, as they are bemused, charmed, and ultimately accepted by the eccentric inhabitants of their adopted home. Resonating with captivating verve and humor, Extra Virgin dishes up a sumptuous sampling of Italian life from an irresistible new voice. Anne Hawes has worked for the past fifteen years as a freelance film editor. She has lived in France and Africa as well as her native England. She now lives most contentedly in Liguria, Italy.